So much has happened in such a short period of time! My rerouted flight to Mumbai went smoothly. A night at the luxurious Leela Hotel was a refreshing way to rest and renew before the 3-hour car ride to Pune. After one night at a local hotel, I was able to move into my flat on Monday morning. Because I have stayed at this apartment before, coming here felt familiar and comforting. I have arranged my room and am feeling settled. The first day of practice at the institute was both familiar and strange. Of course the hall feels extremely different without the presence of BKS Iyengar. Yet the space is filled with his essence, his memory and his teachings. I looked around and saw that like me, most students were doing reclining and forwarding bending asanas to recover from travel and to ease the nerves at the beginning of our period of intensive study. I smiled to see this expression of the wisdom Guruji passed on to us in knowing what to practice, when, and why. Even after all the difficult hours of travel, I did not feel stiff or tense, but relaxed and happy to have finally arrived at the institute. The registration process was smooth and I even had all the correct documents with me on the first try! My Monday class with Abhijata was wonderful. Her class was full of rhythmic movement, with many prop variations on forward extensions, using benches, ropes, slanting planks and more. Her energy, knowledge and humor made the class a joy. 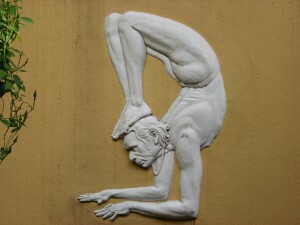 The Tuesday class this morning with Prashant had a different energy, slow and deliberate, with long holds of the poses. As we stayed in the asanas, he guided us to understand how body, breath and mind can participate with each other more fully and more consciously. I was thinking of a phrase that my good friend Nina shared with me that she heard from a senior Iyengar teacher – that our practice should be experiential and experimental. I was reflecting about what these words mean. To be experiential means that we are present to what we are actually, doing, sensing, thinking and feeling, rather than being stuck in past imprints or future plans. To be experimental means to be creative, spontaneous, inquisitive and willing to take risks. I wonder how much of either of these modes I normally apply to my yoga practice. I hope that here under the guidance of these esteemed teachers, and in the company of a group of dedicated practitioners, I can be influenced to be present, awake and alive in what I do. To experience fully this wonderful learning opportunity, and to experiment with new possibilities for understanding and growth. Beautiful Karen! Thank you for sharing. I am glad to hear that you are safely in Pune, settled and savoring your classes! Happy to hear things have smoothed out. Enjoy your time! It is wonderful to hear from you Tia!